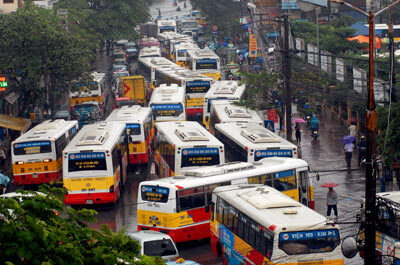 When it's hot in Hanoi, I always wish for some rain every few days but I should be careful what I wish for! It rained the whole night last night and is still raining12 hours later. 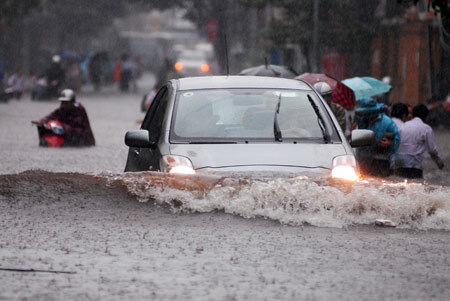 This kind of constant heavy rain is too much for this city which has a terrible drainage system. 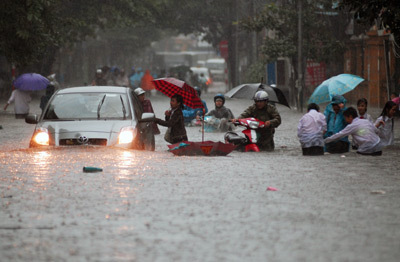 Many streets in Hanoi are now under water and smelly. I decided crazily to go out with one of my friends to look around but was too afraid to take the camera out. I was scared to drop it in the water. Some friends of mine in Cau Giay district couldn't get out of their houses and 2 friends who are teaching in the Australian English center told me, their school has cancelled all afternoon classes as there is no way to enter or exit. The water level in West Lake is really high and I feel like it would get even higher if it keeps raining. I finally made it to Hoan Kiem Lake and the water has broken its banks and is flooding over the road. This is the first time I've seen this since I came to Hanoi 7 years ago. There are lots of stupid people trying to ride their bikes very fast, which sprayed dirty water all over my clothes. I shouted at them and they laughed, such idiots. According to the weather forecast, it will keep going during the weekend plus the cold wind from the north. I hope we survive! To reach beautiful Corfu town, we travelled on 2 ferries, 4 buses and a taxi at the end to reach my friend’s house. It’s truly a beautiful house with a private beach right at the back gate. We were so happy to be there and it was worth all of our traveling trouble. Corfu town is such an amazing place, the streets lined with beautiful old Venetian buildings, of different colors and designs. 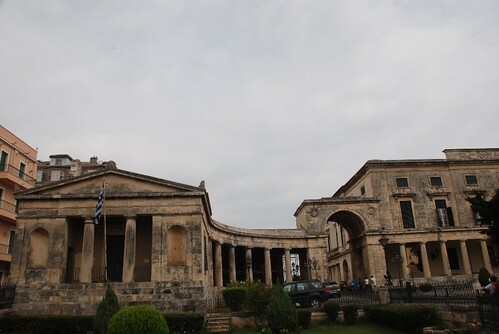 Of all the places we visited in Greece, the world heritage protected town of Old Corfu is one of the highlights. Apart from the architecture, the main activities in the town are shopping and eating. The cobbled streets are lined with jewellery and leather shops but you really need to know something about gold and the price because its confusing - so many choices. 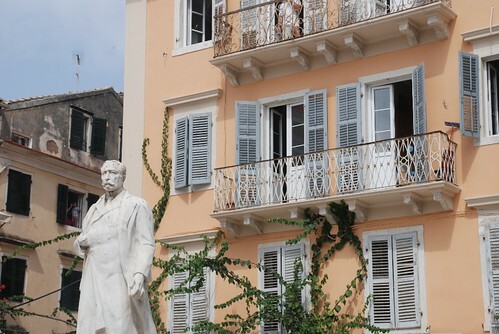 60% of thepopulation in Corfu is of British origin. In fact, Queen Elizabeth's husband, Prince Phillip, was born on the island. Much of the tourism her caters for them - they even have their own shop, called The English Corner Shop. Of course, there are tons of English tourists around. 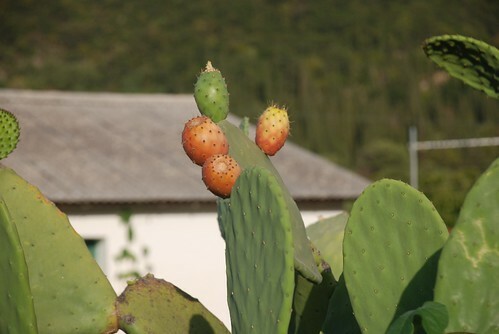 Even though a lot of English is spoken around Greece, I felt that I could communicate and be understood best in Corfu. Wandering around the old town of Corfu is great as it’s close to museums and historic places but the beaches on this island didn’t impress me much as they are busy and crowded all the time. I can’t really relax when the beach is so crowded. 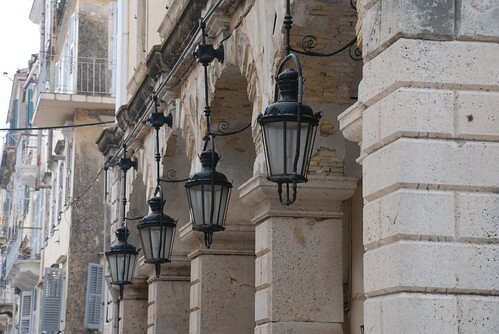 For the old town alone, I would recommend Corfu, though. I hope to get back there some time. While in Crete, I was wandering around Iraklio port and the shopping areas in the afternoon, the day before we left. I thought I saw something familiar from the corner of my eye and I turned my head to see an Asian restaurant called Lee's Asian Fast Food. 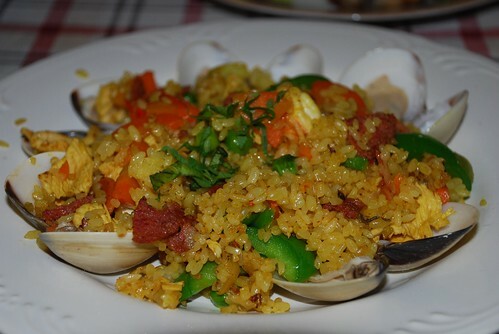 Having been away from home almost 5 weeks, even though I was adapting quite well to feta cheese and other Greek food, what I missed the most was Asian food. I walked over toward the restaurant and sat down to order fried rice which looked really good in the photo. The waiter was Greek and I thought this would be a Chinese restaurant, which didn't bother me because I love Chinese food as much as Vietnamese food. While waiting, I heard someone speaking in Vietnamese behind me and I turned around. It was a little girl talking to her parents. I couldn't believe that I would meet a Vietnamese family in a place like Iraklio, so far from our homeland. 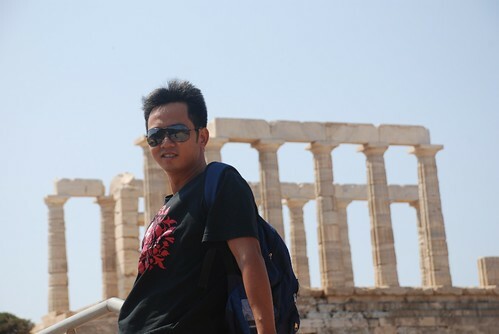 I'd hardly seen any other Asians in some parts of Greece. I started up a conversation with them and it turned out they're from Tra Vinh, a southern city of Vietnam. 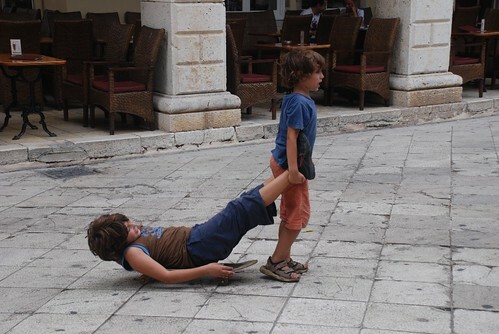 They moved from there to Holland about 10 years ago but had moved over to Greece in the last 3 years. Following what they told me, life in Holland was getting more expensive and hard for them, so they decided to move to Greece hoping for an easier life and they're happy with it now. Lee's is the only Asian restaurant in town(I think) so they don't really have much competition. I also noticed that most of the other customers were western people so I gathered that there are not many Asians in Iraklio. They also said that they have to buy lots of their ingredients from Germany as they don't have lots of choices in Iraklio. They had to serve fusion Vietnamese - Chinese food as not many people are familiar with Viet Nam and its food. The food itself, fried rice and spring rolls, was actually pretty good. Ps: I can't upload any photos from Lee's restaurant as I lost them all due to virus attack on my hard drive. Talking about Hania brings back memories of a beautiful old town with lots of amazingly gorgeous old restaurants, shops and cafes. 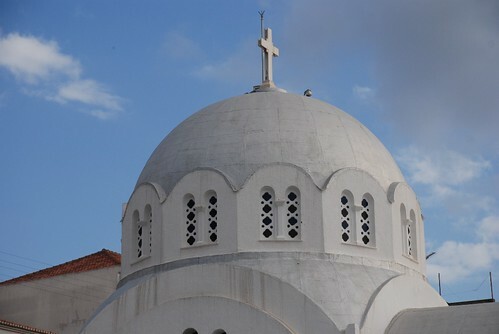 We only stayed in Hania for a day to wonder as we had arrived early in the morning but we couldn't find a hotel or guesthouse as they only open from 8 or 9 am. I was disappointed about that but that's the way it is. We had such a lovely day in Hania, wandering around the old Venetian town, enjoying the cobbled streets, great shops and the atmosphere. We met some interesting people, including restaurant touts, Chinese salesmen with toy parrots that repeat everything you say and some very smooth talking jewellery shop proprietors. All different people with different stories and they seemed to know about everything around us. As I was travelling with 2 Australian friends originally from Melbourne, we met lots of the locals with connections there. Melbourne has a large Greek population due to large amounts of post-WWII migration. Most of the people we talked to have some relatives or friends who are living in Melbourne. 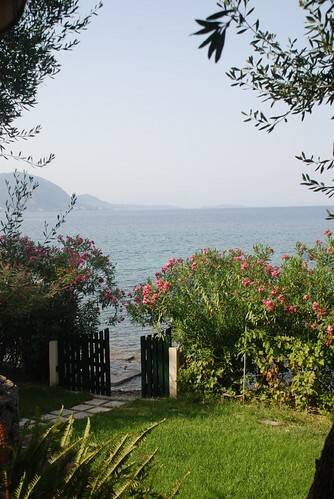 Some even lived there themselves before returning to Greece to retire. Hania city looks like a multi-coloured painting. In every corner, you can see and find something different and you actually can learn from it. 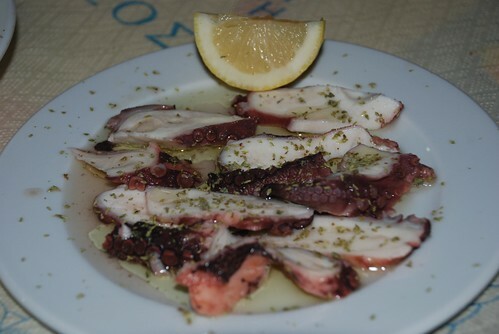 Most of their restaurants are located in the ruins of old venetian buildings with open roofs and amazing decor. Of course the prices were pretty amazing, too! I think, I would comeback here if I have a chance as Hania is such a gorgeous place. Ps: I can't upload any photos from Hania as I lost them all due to virus attack on my hard drive. 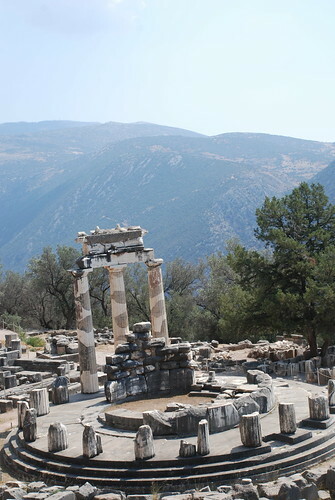 We took a local bus and it took us around 4 hours to arrive in Delphi. This town in the mountains next to Athens has stunning views of the Gulf of Patras. Walking up and down the town only takes 30 minutes but every corner and every alley has something to look at and wonder about. Luckily we are travelling in low season so things are cheaper here, especially hotels. We checked in at the Olympic Hotel, a really friendly family run hotel with an absolutely great view down the mountain from our balcony. Loved it. We could see most of Delphi and the sun came in the window to say hello, waking us up at 7 am. Nik, the owner gave us helpful information about this town and its history. We started our walking down to the ruins after breakfast. 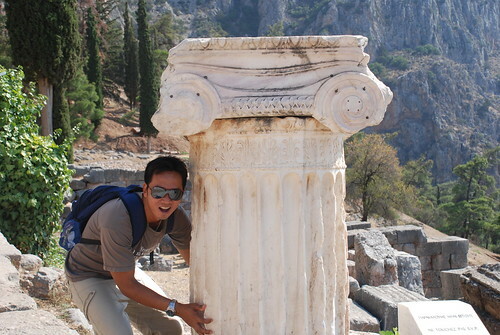 The ruins here consist of Ancient Delphi and the Sanctuary of Apollo, which are located on the hillside. There is also a great museum which I passed and now regret as my friends told me it was a beautiful museum. 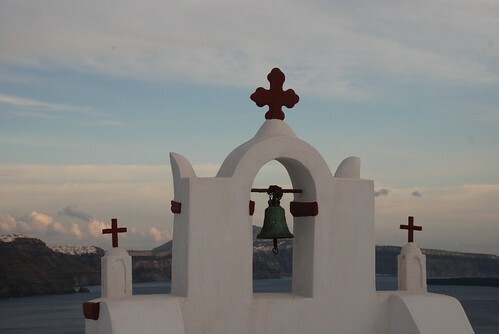 We spent about 2 hours there before heading to the Sanctuary of Athena, which is a 7 minute walk. We had a good talk to an old man named Christopher. He was really funny. 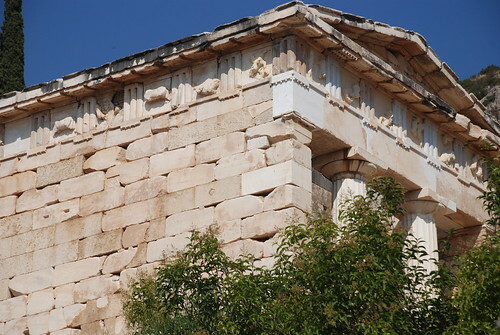 We talked about everything, about Greece and about Delphi as he was born here and lived most his life here. We continued our venture to the next town after we walked back to Delphi, had some souvlaki for lunch then took a bus to Avahora. It's another pretty small town, which is actually a ski resort in winter, with lots of small shops selling most types of Greek souvenirs. It's great and the people around here are very friendly. We returned to our hotel after our long walk around town, for dinner, which included another Greek salad with lots of cheese and olives which is my favorite.